My name is Amanda, I'm 25 and I live in New York! BF4 is the first and only fps I've played! I play some other games like Final Fantasy XI and XIV and Minecraft. I'm pretty much a typical girly girl who loves shopping. I recently got back into anime and video games and have been loving it. I've met a few of you ADK members and love you all and can't wait to meet the rest and get to know everyone!! Hi and Welcome to the forums. I believe I played with you in BF4 earlier this morning. Hello Amanda!! Welcome, welcome. A battlefield fan huh? You're going to make a bunch of friends fast, better make room in that orgin list. Start with me. Official_Surdawi is my ign. Have you put in an app in yet? If not I do encourage it, we have a great recruiter @[member='WhiteVastNinja'] . You can use me as a reference if you like, I am known...you can say lol. I can't wait to get online to squad up, we adk can really play some lockers. (Until we rage quit at 3am) Good Luck!! It was fun playing with you guys! @[member='Type2dk'] and @[member='WhiteVastNinja'] !! 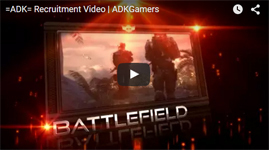 @[member='AmandaNoelle'] Welcome...Welcome you here in ADK community , i played with you some rounds in bf4 , it was great i enjoyed that :) , hope to see you everyday in the game and in TS. @[member='AmandaNoelle'] Hey! Welcome to the website! I'm not on teamspeak too much anymore, but if I come on, I'll keep an eye out for ya. She's a professional photographer as well. @[member='FeatherSton3'] Thanks! :) I look forward to seeing you around!! Catch you in TS sometime. Goodluck on your app. And yes @[member='AmandaNoelle'] as @[member='Pepsi'] mentioned I'm into photography as well. Like to do it during any free time I have which isn't much. @[member='AOBLXIX'] @[member='Darknae'] Hurray for photographers!! Good luck on your dream! haha, no I like it. I admit it is abit overkill for my paygrade but I started with a 500D (think it's called Rebel or something in the US) which I grew out of fairly quick. Well I'm glad to see you in ts. Not so much in the game though since you tend to kill me all the time. Lol. J/k. Glad to see you. Stick Around and have fun. what kind of animes do you watch ? favorites ? @[member='Jmanowell'] Haven't seen Guilty Crown or Log Horizon :) I'll check them out! Thanks!